10K is part of the Western NH Trail Run Series. 5K - Begins 9:10 AM () - runners, walkers, families and youth welcome! Walkers and families will start immediately after the runners. 10Kis a hilly figure 8 course on some beautiful and challenging trails. Primarily single track. Please note: race route is subject to change if there is a change in trail conditions. From I-91 Take exit 9 and turn left onto US Route 5 to Windsor. Turn right onto Route 44 in Windsor and proceed for 5.4 miles to Ascutney Mountain Resort. The Resort will be on your left just before the village of Brownsville. Registration will be at the Ascutney Trails Kiosk. Free parking in the Cunningham lot or overflow in the upper ski area lot. Sarah Yates (31:48) Cool, humid, and wet. Trails very slick & muddy from rain immediately before race start. Sarah McDougle (30:47) Perfect sunny, dry, moderate weather. Trails a little slick from rain the night before. 5K is a moderately hilly lollipop course on mixed single and double track trails. 5K Details (with trail names): The race begins with a 3/4 mile meander through field and forest along a trail that has boardwalks through the muddy spots (Home Again). The next 1/2 mile is a double track climb (Home Again) to a single track traverse along a hillside where you can enjoy the falls if it has rained recently (Falls Trail). Up a short but steep hill to emerge into the field (Mile Long Field) where you can enjoy the view while you get a drink. Begin your return trip, almost all down hill, along challenging but fun single track (right into Cort's Jester, left into New Blue) coming back out into the mile long field. A quick double track jaunt back (to the old Nordic Center parking lot) and then return with the 3/4 mile meander that the race started with (Home Again). 10K is a hilly lollipop course on some beautiful and challenging trails. The first half is primarily ascending on mixed single and double track. The second half is primarily descending on single track. Follows the 5K course for the first and last miles of the race. 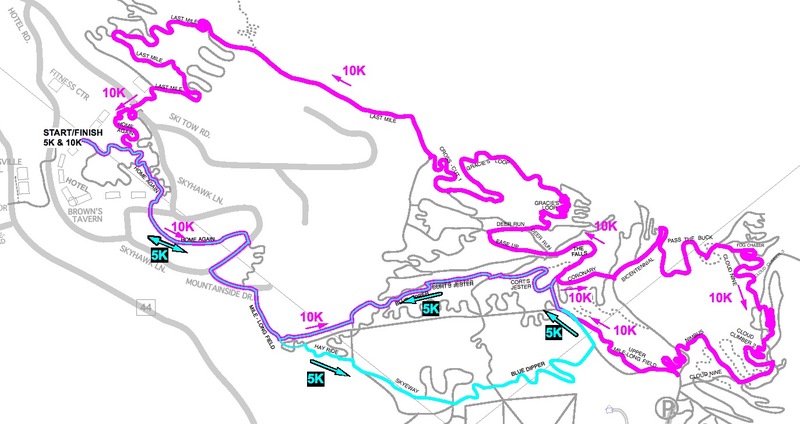 10K Details (with trail names): The race begins with a 3/4 mile meander through field and forest along a trail that has boardwalks through the muddy spots (Home Again). The next few miles of the race is primarily climbing, first along double track (from the Nordic Center lot, up Home Again, left into Deer Run, left into Gracies Loop DT), and then along a beautiful wooded trail dotted with large boulders. (Gracies Loop ST). Begin a brief but fast descent (Gracies Loop, then down steep Home Again DT) and then turn into a traverse along a hillside and enjoy the falls if it has rained recently (Falls Trail). Continue ascending (read: hiking) up a short but very steep double track (Coronary, left onto Bicentennial, left into Quarry) and onto single track again (right into Pass the Buck). Congrats! Your climbing is more or less done here, about the halfway point in the race. Begin a long fun descent with some challenging footwork (Cloud Climber, right onto Nimbus) and then emerge into the fields (Upper Mile Long Field) before rejoining the 5K course along fun single track (right into Cort's Jester, left into New Blue) coming out into the mile long field for the third time. A quick double track jaunt back to the Nordic Center lot then return with the 3/4 mile meander that the race started with (Home Again).